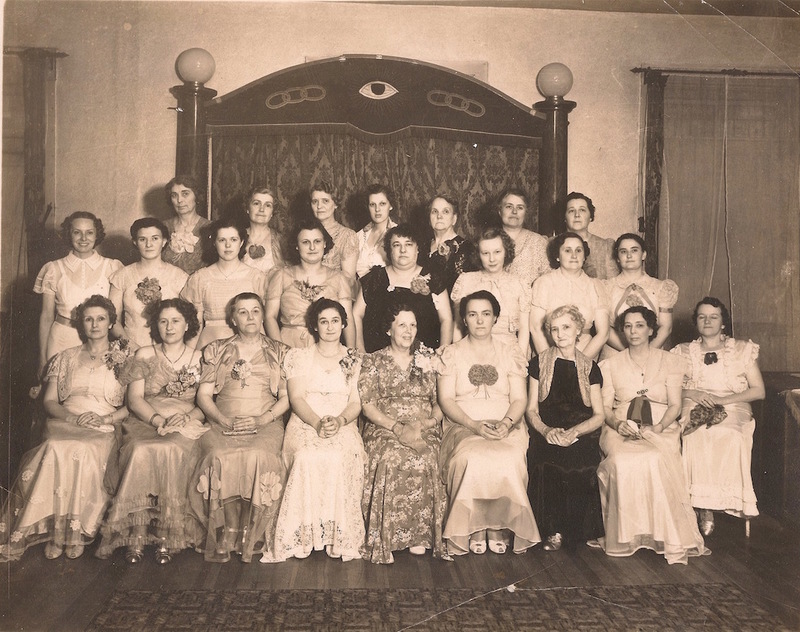 A group portrait of a Rebekah Lodge, posed in evening gowns, seated and standing (probably) in an Odd Fellows lodge room. 24 women arrayed in three rows, all in gowns, many wearing flower corsages. They pose in front of an architectural element with wooden columns topped with glass globes or lamps. Between them is a wooden arch decorated with an all-seeing eye in the center and IOOF triple link emblems to either side. An embroidered drape hangs below it. Camera view probably from a person standing on a bar or chair. 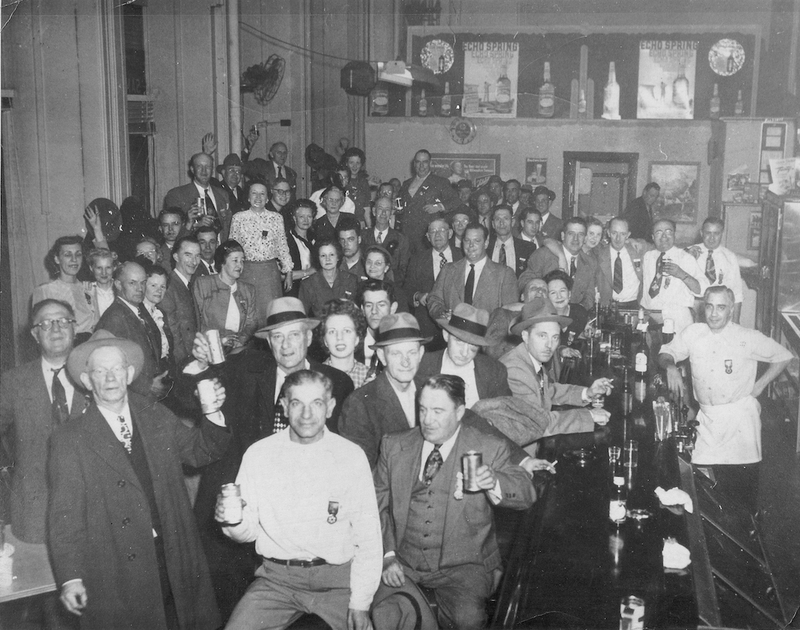 A bar room full of people, about 55 men and women, all face the camera, many of them wave or raise a can or glass in cheers. Most wear business attire; this is not a wealthy crowd. Many of the men and women wear medals or badges, many of which can be seen to be IOOF 25 or 50 year pins. Even the barkeep, in apron with his sleeves rolled up, wears such a medal. With everyone dressed nicely and so many with their medals on, this is surely a group on their way back from Lodge or an event, having stopped at the local Odd Fellows bar, all out together for a drink. One man about 3 inches straight dexter of the barkeep looks a tad forlorn and seems to have a shiner. On the wall in the background can be seen large ad posters for Echo Spring Straight Bourbon Whiskey and Schlitz. The Echo Spring ad has a possible date of 1950, which helps to date the image. Toned gelatin silver print, mounted to heavy brown card. 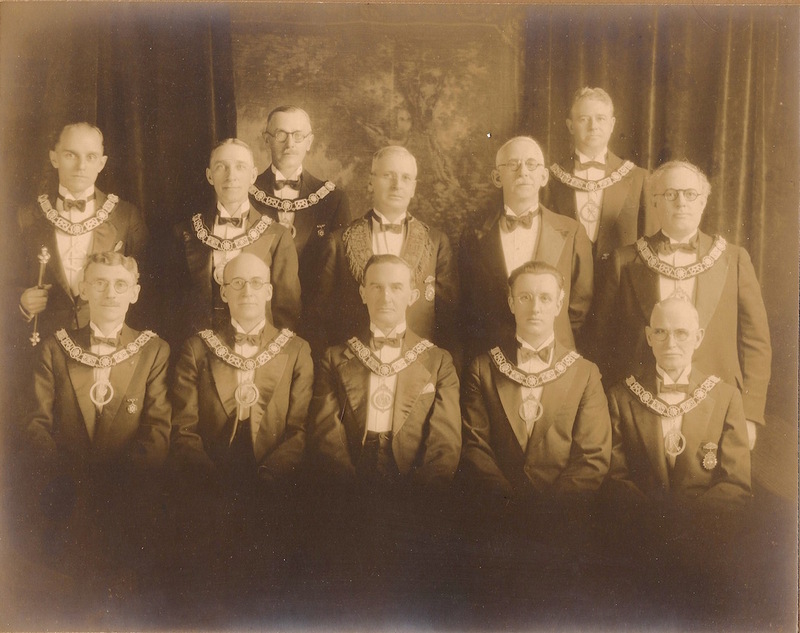 Formal portrait of 12 Odd Fellows Grand Officers. They are posed, in front of drapes flanking a painted or embroidered view of trees, in two rows of five, with two more standing behind. They all wear tuxedos with bow ties. Only one of them, center, wears an IOOF collar, which appears to be embroidered with “GA” or “GR” dexter lapel and “RI” or “RT” sinister lapel. All others (save one, who wears no medals or insignia) wear more common American fraternal officer collars with large medallions. Two of the men wear IOOF 25/50 year pins, the only particularly IOOF emblems visible. Man standing far dexter holds a metal baton. Deep vignette shadow encompasses the lower third, and is somewhat crooked. Albumen silver print with purple-black toning, mounted on heavy black card. 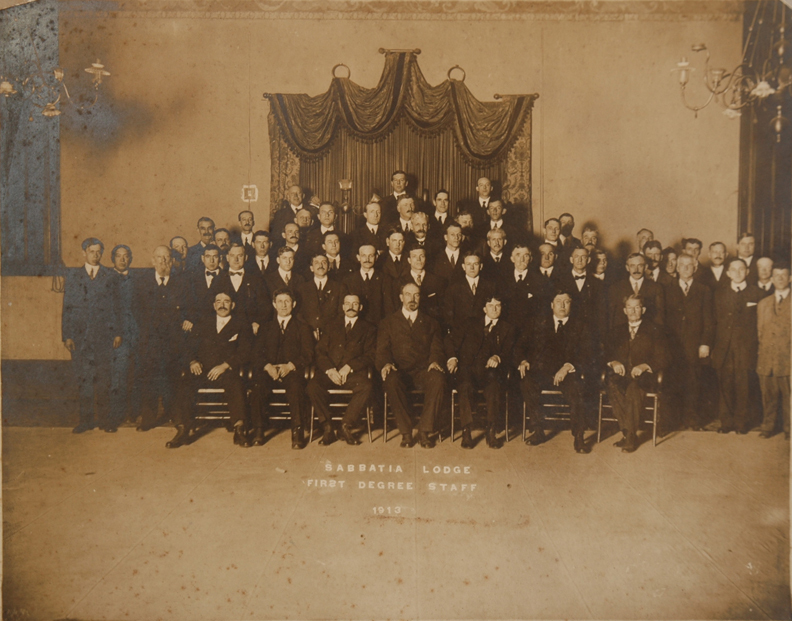 Group portrait of some 76 Odd Fellows, all wearing IOOF collars or officer sashes. Four men hold white staffs or spears. They are posed in 4 rows, in front of a white clapboard building with windows. The trunk of a slender tree bifurcated the shot, just dexter of center, and several men lean slightly to still be in view of the camera. Albumen print mounted on heavy black card. 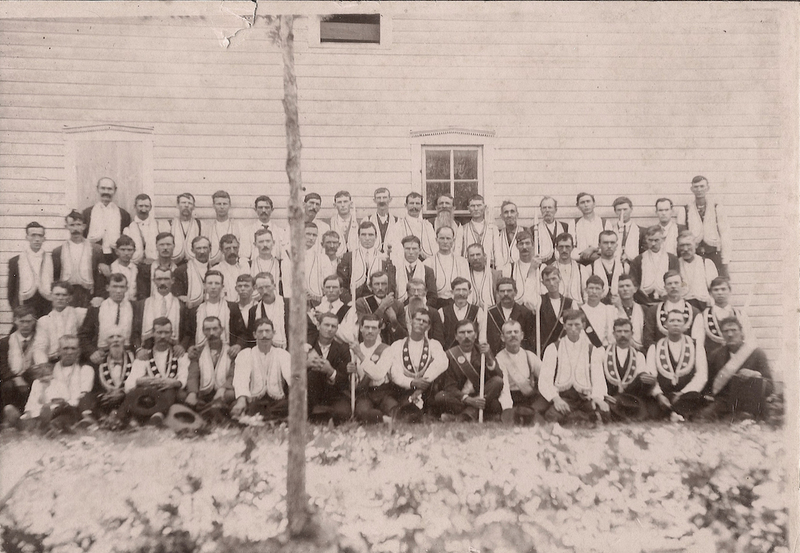 Group portrait of some 39 Odd Fellows, all wearing IOOF collars and officer sashes. Four men, dexter, hold wooden staffs or spears. The composition of the group is haphazard, poorly posed. Man furthest dexter is cut off at the edge of the photo. They pose under some trees, with fences and buildings in the background. Albumen print cabinet card, though of an extremely unusual dimension. Beveled edges of the card are gilt. Standing, full frontal portrait of a man in the uniform of the IOOF Patriarchs Militant, including long frock coat, sword belt and baldric, an elaborately decorated sword (drawn), white gloves, and a pillbox hat. His collar has the emblem of the Patriarchs Militant with the single bar of the rank of Canton Ensign. His pillbox hat (similar to a Scottish Rite hat) has a triangular emblem with a crown over the crossed sword and shepherd’s crook. At his cuffs are further crown emblems. His plumed chapeau hat is situated on a small carved table, dexter, and a low piece of wooden furniture sinister has an oriental rug cascading off of it, behind him. 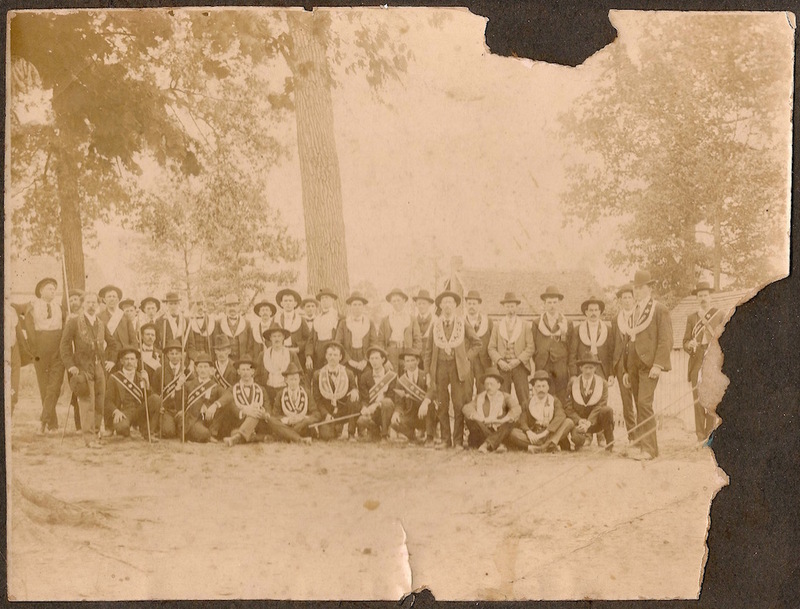 Panoramic group portrait of Independent Order of Odd Fellows Patriarchs Militant Grand Encampment formation, posed for a group portrait. There is no particular indication of which Encampment is represented here. 18 men in military style uniforms stand at attention, swords drawn. They are posed with their toes at a line or cord tied off and pegged into the grass, no doubt to position them for a rotating camera. An odd sort of cabinet card, photographic process uncertain. Photo has a purple cast to it. Card backing is faced with yellow paper with a stone texture and a marble-like printed pattern. The logo of the maker is embossed into the surface, RC margin. The name “Brooks” is printed LR margin of photo mount area, but it is unclear if this is a photographer, or…? 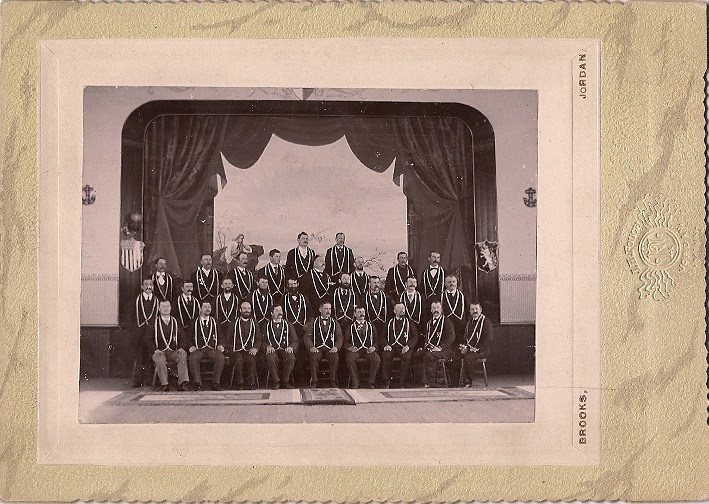 A group of 28 Odd Fellows in dark suits and collars, posed on a stage with a drawn curtain and proscenium. Behind the men can be seen a painted backdrop, depicting a young man with a satchel running (?) past a rock outcropping. An angel carrying a lyre appears, center of the backdrop. On the viewer’s left side of the proscenium hangs a shield styled after the flag of the United States. Opposite hangs a shield with an animal (unicorn?) rampant. Several of the men are looking, not at the camera, but up and to their left. Others face the camera. Large format cabinet card, probably albumen silver print, mounted onto larger card with decorative dark borders. Photograph and card both sepia. Group portrait of about 57 men, standing and sitting, all in dark suits, with no medals, badges, or other regalia particularly visible. They are grouped before an ornate curtain backdrop, probably a stage, the raised floor of which may be visible CL. To left and right are grand wooden pilasters against the wall, and chandeliers hanging. Internet search turns up a Constitution & By-Laws volume for Sabbatia Lodge #225 IOOF, Taunton, MA.